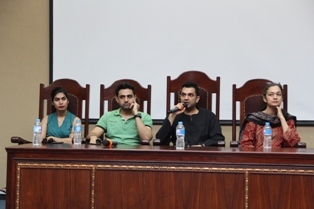 On 10 April, FJS arranged another informal interactive session with the caste of Jhaanjar Di Paawaan Jhankar, A theatre play of Olomopolo.The guest speakers were Iman Shahid, Sarmad Sultan, Zain Afzal and Sumaiyya Mumtaz. They talked about the importance of theatre and also guided the students on how theater is the most essential phase of learning acting. In addition to it all the actors shared their experiences related to their theater career. 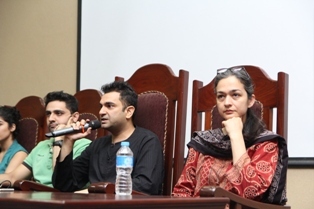 “Theater must not earn equal to films and dramas but it can enrich you with the real essence of acting as you don’t act with a specific part which is visible on screen, you get into character and then your whole body plays the role” said Sarmad Ali Sultan. 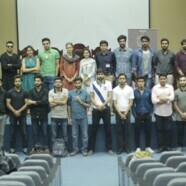 It was a golden opportunity for specially the students of Mass Communication at FCCU because they got to learn from the experience of such big names of the theatre world. 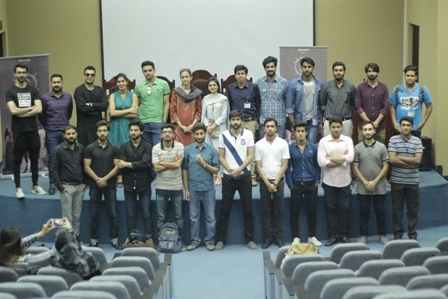 All the questions and concerns of the students were answered and it was an informative and very useful session arranged by the advisor of Forman Journalism Society, Mr Saqib Saleem. We wish the good luck to the team of Jhanjar di Paawaan Jhankar.